Yesterday Joel Madden posted this cute picture of Nicole and Harlow having a Mother's day lunch.. "Happy Mom's day! Join us and make a donation for Mom's day to other Moms who need it: Text CHILD to 90999 to donate towards the work our foundation is doing! Thanks and Godbless! Ok back to brunch!! " Later on that evening Nicole Richie went for a meal with friends Samantha Ronson, Kelly Sawyer, Sophia Rossi and her beau Joel. 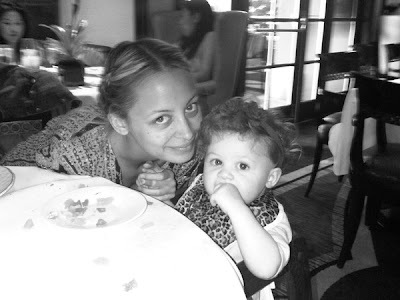 Joel also shared this picture from the meal night..
And my little queen of the milfs @nicolerichie I'm the only guy here.Lucky me.Its like the sisterhood of the traveling pants up in here...stella just got her groove back.